A free ping monitor utility with the visual interface to track connection to remote hosts, located in LAN/WAN or Internet. The application sends pings on a regular basis and analyze response to detect status of connections. Connection outage is reported automatically if ping response isn't delivered a particular number of times in a row. The application has a visual interface that displays a current state of connections to monitored hosts and reported statistics. For every host you can see an uptime, number of detected outages, average ping time, ping time deviation and other important parameters that allow you to measure a quality and stability of connection. 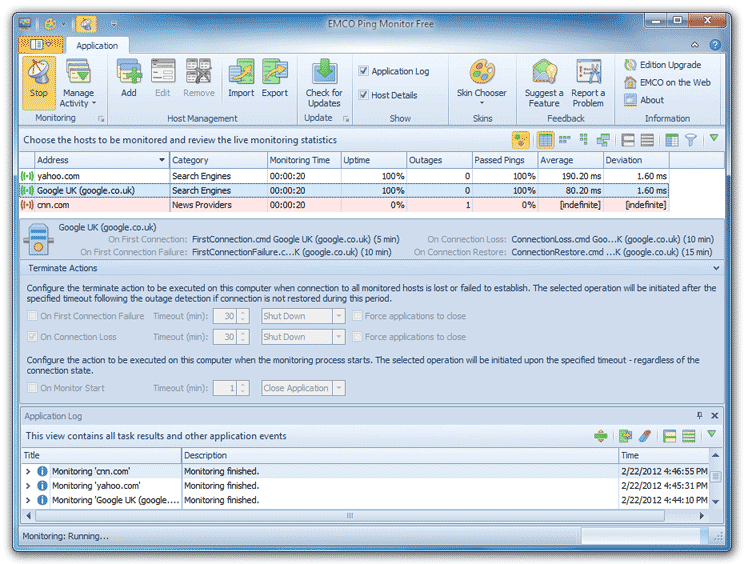 In case of connection outage Ping Monitor can immediately notify you about a problem by displaying System Tray message and/or sending an e-mail alert. If your mobile operator supports E-Mail-to-SMS service, you can receive SMS alerts on the mobile phone. The application allows to send alerts on connection establishment, loss and restoring events. If you need to execute some actions on the connection change events, you can register custom handlers in the application. These handlers will be executed automatically every time when connection state will be changed. You can specify any command, script or application as a handler. You can configure the application to pass the status information to handlers as a command-line parameters. For example, you can pass host name and its status as parameters to a script.